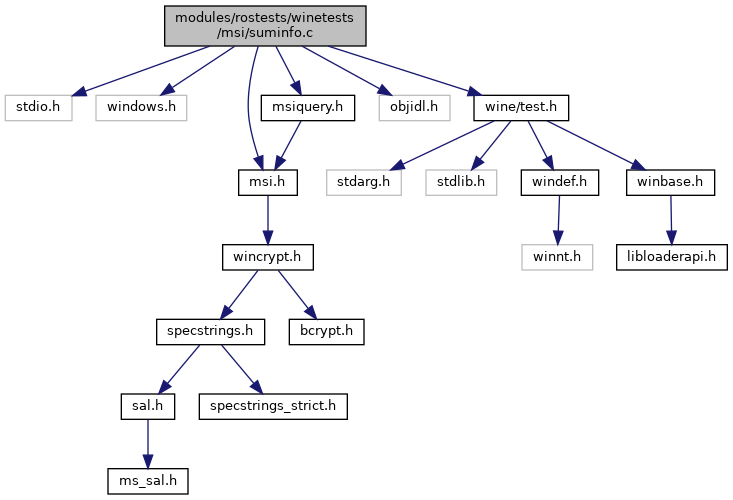 static const char * msifile = "winetest-suminfo.msi"
Definition at line 21 of file suminfo.c. Definition at line 290 of file suminfo.c. Definition at line 60 of file suminfo.c. Definition at line 46 of file suminfo.c. Definition at line 58 of file suminfo.c. Definition at line 43 of file suminfo.c. Definition at line 48 of file suminfo.c. Definition at line 54 of file suminfo.c. Definition at line 42 of file suminfo.c. Definition at line 52 of file suminfo.c. Definition at line 47 of file suminfo.c. Definition at line 50 of file suminfo.c. Definition at line 53 of file suminfo.c. Definition at line 55 of file suminfo.c. Definition at line 64 of file suminfo.c. Definition at line 63 of file suminfo.c. Definition at line 62 of file suminfo.c. Definition at line 56 of file suminfo.c. Definition at line 51 of file suminfo.c. Definition at line 61 of file suminfo.c. Definition at line 45 of file suminfo.c. Definition at line 49 of file suminfo.c. Definition at line 59 of file suminfo.c. Definition at line 44 of file suminfo.c. Definition at line 57 of file suminfo.c. Definition at line 461 of file suminfo.c. Definition at line 292 of file suminfo.c. Definition at line 70 of file suminfo.c. Definition at line 399 of file suminfo.c. 423 * but it appears that we're not allowed to read it back again. 424 * We can still read its type though...? const char* msifile = "winetest-suminfo.msi"
Definition at line 66 of file suminfo.c. Referenced by test_suminfo(), and test_summary_binary(). Definition at line 67 of file suminfo.c. Referenced by test_create_database_binary(), test_suminfo(), and test_summary_binary(). Definition at line 287 of file suminfo.c. Referenced by _Dispatch_type_(), _Function_class_(), add_zone_to_listview(), bindresvport(), bindresvport_sa(), DispCallFunc(), CShellCommandDACL::Execute(), CShellCommandSACL::Execute(), get_sd(), get_top_level_sd(), getInterfaces(), IMAGEHLP_GetSecurityDirOffset(), IMAGEHLP_SetSecurityDirOffset(), CDefView::InitList(), InstallOneService(), ITERATE_InstallService(), look_for_collision(), main(), make_file_orphan(), CDefView::OnNotify(), registry_callback(), RSAENH_CPGetProvParam(), RSAENH_CPSetProvParam(), security_cleanup_zones(), security_dlgproc(), security_enum_zones(), security_get_sd(), security_on_destroy(), security_on_initdialog(), security_on_notify(), send_add_dir(), send_inode(), send_inode_extref(), send_inode_ref(), send_utimes_command_dir(), set_file_security(), SHELL32_CompareDetails(), SHGlobalCounterCreateNamedW(), test_AddMandatoryAce(), test_child_token_sd(), test_child_token_sd_medium(), test_child_token_sd_restricted(), test_container_sd(), test_create_database_binary(), test_CreateDirectoryA(), test_default_dacl_owner_sid(), test_default_handle_security(), test_event(), test_FileSecurity(), test_get_security_descriptor(), test_GetNamedSecurityInfoA(), test_GetSecurityInfo(), test_items(), test_maximum_allowed(), test_namespace(), test_ParseName(), test_reg_create_key(), test_reg_open_key(), test_RtlMakeSelfRelativeSD(), test_security_descriptor(), test_service(), test_ShellExecute(), test_system_security_access(), test_SystemSecurity(), test_token_label(), test_token_security_descriptor(), test_Verbs(), update_security_level(), update_zone_info(), and validate_default_security_descriptor(). Definition at line 288 of file suminfo.c. Referenced by _bdf_is_atom(), _bdf_list_split(), _cgets(), _i64tow(), _tcsrchr(), _ui64tow(), AddPrincipalListEntry(), AddPrincipalToList(), AddSelectedPrincipal(), basic_tests(), BuildDefaultPrincipalAce(), Telnet::Connect(), Control_DoLaunch(), create_ax_site(), create_serviceprovider(), DestroySecurityPage(), DGifGetImageDesc(), DGifSlurp(), do_query_service(), eval_expression(), fallbackQSort3(), ShellDirectory::find_entry(), for(), frame_set_seek(), framehandle(), FreePrincipalsList(), FreeSavedImages(), get_ldnumber(), get_long_path_name(), get_sec_mgr(), horDiff16(), horDiff32(), horDiff8(), IDirectPlay4Impl_InitializeConnection(), IDirectPlayLobby2AImpl_CreateAddress(), IDirectPlayLobby2AImpl_EnumAddressTypes(), IDirectPlayLobby2Impl_CreateAddress(), IDirectPlayLobby2Impl_EnumAddressTypes(), IDirectPlayLobby3Impl_EnumAddressTypes(), IDirectPlayLobbyAImpl_CreateAddress(), IDirectPlayLobbyAImpl_EnumAddressTypes(), IDirectPlayLobbyImpl_CreateAddress(), IDirectPlayLobbyImpl_EnumAddressTypes(), insert_sic(), LazyUnixLocalGlob(), LoadPermissionsList(), main(), mainQSort3(), ME_GetParaLineSpace(), netfinger(), ObjectIdentity_IsEqualObject(), ObjectWithSite_SetSite(), patmatch(), PersistPropertyBag_Load(), PredictorDecodeRow(), PredictorDecodeTile(), PredictorEncodeRow(), PredictorEncodeTile(), PredictorPrintDir(), PredictorSetup(), PredictorSetupDecode(), PredictorSetupEncode(), PredictorVGetField(), PredictorVSetField(), ReadStyleSheet(), ReloadPrincipalsList(), remove_sic(), ResizeControls(), RTFDestroyAttrs(), RtlIntegerToUnicode(), s_sum_sp(), SecurityPageCallback(), SecurityPageProc(), ServiceNameToPortNumber(), SidLookupCompletion(), SpoolName(), Mapdesc::subdivide(), SymInitialize(), SymSetSearchPath(), tcp_build_and_update_options(), test_create_database_binary(), test_QueryService(), test_security(), test_ShellWindows(), test_sp(), test_VarBstrFromCy(), test_VarBstrFromDec(), TIFFPredictorCleanup(), TIFFPredictorInit(), TIFFVGetFieldDefaulted(), UpdateControlStates(), UpdatePrincipalInfo(), UpdatePrincipalListItem(), xdr_bytes(), xdr_short(), xdr_string(), Mapdesc::xformBounding(), and Mapdesc::xformSampling(). Definition at line 286 of file suminfo.c. Referenced by CMenuBand::_ChangeHotItem(), CMenuBand::_ChangePopupItem(), CMenuBand::_KeyboardItemChange(), CMenuBand::_MenuItemSelect(), CISFBand::CloseDW(), CISFBand::CreateSimpleToolbar(), CTrayBandSite_CreateInstance(), D3DXSHMultiply2(), D3DXSHMultiply3(), D3DXSHMultiply4(), FILEDLG95_InitControls(), inflate_trees_bits(), CMenuStaticToolbar::OnDeletingButton(), CMenuSFToolbar::OnDeletingButton(), CISFBand::OnWinEvent(), parent_wnd_notify(), parent_wnd_proc(), reiserfs_new_form_blocknrs(), tagCompare(), tagNameCompare(), test_create_database_binary(), test_save(), TOOLBAR_Restore(), UDFReadTagged(), and UDFSetUpTag().